Allah created man to be His servant and to implement His Way on earth. If humans distance themselves from this message, then they distance themselves from God’s injunctions. That is why Islam has prepared its followers to follow this righteous instinct; it is a joy to our spirit to stand and think of the greatness of Islamic justice, how fair Islamic law is to individuals and groups, rulers and the ruled! Let us shed light on one of Islam’s greatest and brightest symbols of justice, Shurayh Al-Qaadhi (the judge), who narrates: The Caliph `Umar ibn Al-Khattaab, may Allah be pleased with him, bought a horse from a Bedouin, paid its price and rode off with it. However, after traveling a little distance, the Caliph noticed some kind of defect in the horse, so he returned to the seller, requesting him to take it back since it was defective. The man refused, telling the Caliph that the horse was perfectly healthy when it was sold to him. `Umar, may Allah be pleased with him, told the man to choose a judge and the man suggested Shurayh ibn Al-Haarith Al-Kindi whom `Umar, may Allah be pleased with him, accepted. `Umar, may Allah be pleased with him, did not threaten the Bedouin or misuse his power, neither did he tell the Bedouin that he had exceeded his authority nor that he would get back to him. No, `Umar accepted the judge’s decision with all modesty. `Umar, may Allah be pleased with him, admitted that the horse was healthy when he took it and he accepted the judgment, making the case an everlasting example of Islamic justice. 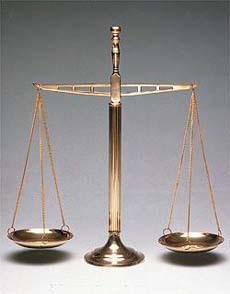 The judge’s fairness made ‘Umar, may Allah be pleased with him, appoint him as a judge of Koofah. He rewarded the judge for his justice and fairness and did not jail him for ruling against him, as some leaders may have done in present so-called ‘democracies’. The man agreed to let a judge decide, which ‘Ali, may Allah be pleased with him, accepted. They went to Shurayh who asked ‘Ali, may Allah be pleased with him, for his side of the story. ‘Ali, may Allah be pleased with him, said that the shield was his and that he had found it with that man; it had fallen off his camel and he had never sold it or given it to anyone. The judge turned to the other man asking his story. The man said that he did not accuse ‘Ali, may Allah be pleased with him, of lying, but the shield was his, as it was in his hands. The man, who was a non-Muslim, then said: “O ‘Ali, the shield is yours. What a great religion! I can sue ‘Ali and get a judge to pass a decision for my benefit! I declare myself a Muslim.” He told the judge that he was following the army and had seen the shield fall down and picked it up. ‘Ali, may Allah be pleased with him, then told him to keep the shield, and on top of that, he also gave him a horse. Soon after, the man was seen under Ali’s leadership fighting the Khawaarij [Kharijites –are one of the deviant sects, who follow their whims and desires and innovation, and deviated from the path of Ahlus-Sunnah wa’l-Jamaa‘ah]. Are these two examples not sufficient for us to follow those great men?